Crude oil has been used to produce petroleum products such as gasoline, waxes, and plastics. It has also been heavily used in manufacturing, industrialization, and transportation. Since crude oil is found in certain geological areas, some countries are more likely than others to be sitting on large oil reserves. 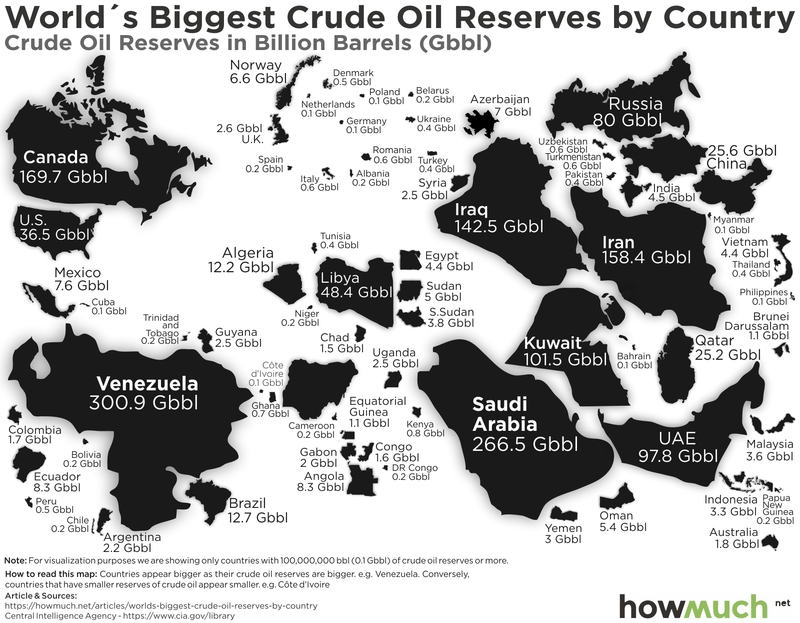 Our new visualization shows how much oil is in each country’s reserves. Oil reserves are measured in Gbbl (billion barrels). Our data comes from the CIA Factbook. About half of the countries in the top ten list are located in the Middle East/North Africa region. Six of these countries--Venezuela, Saudi Arabia, Iran, Iraq, Kuwait, and Libya--are members of OPEC (Organization of Petroleum Exporting Countries). Interestingly, there is no clear correlation between the country’s size and its amount of oil reserves. For example, Kuwait, which has a landmass of 17,818 sq km, has 101.5 Gbbl in oil reserves, whereas Russia, which has a landmass almost ten times larger, only has 80 Gbbl in oil reserves.